i've tried shooting at a static mesh (set to block all) and a "physics blocking volume", in both cases the projectile was ignored, i think it was ignored and not overlaped because the "on begin overlap" event was not fired. so... what am i doing wrong? updating: i've just solved the problem, apparently for some reason bounce only works when the collision component is the root component, simple setting the collision as the root component solves the problem, still it's weird i can't understand why it don't works without it being root component, but ok. Thanks for that. Saved me some time! Try setting the collision of the projectile under "Collision Enabled" to query AND physics. At the moment, all it is doing is generating overlap events when it collides. good point, but it still ignores the blocking volumes, actually it pushes meshs with "simulate physics" but doesn't bounce, even when i set the mass to an giant number, it just pushes the mesh and the projectile velocity and direction aren't changed at all, and if i try to shot things with physics off and collision presets:"block all" it just ignores the mesh. All you need to do to make it bounce is stop it from destroying the projectile when it successfully hits by removing the end node. Or using a "delay" node before deleting it. You're using a child class of the parent projectile, which isn't giving you the functionality you want to begin with. You're probably better off starting again and creating your own. All it needs to have is an event hit. To adjust the force applied by the projectile when it hits you can change the impulse multiplier. Either by setting it literally or creating a variable then plugging that into it. ty for trying to solve my problem, looks like you've put some time into it, but unfortunatelly i don't think this will solve my problem, the "projectile" class parenting my "LaserProjectile" isn't the one in the picture, my "projectile" class is pretty different from this one, and it's parenting a lot of different projectiles in my project, removing the parent class and remaking the class would make a mess in my code, so i won't take this as an option, i don't have a problem with the projectile being destroyed after a collision, also this code in the projectile doesn't seem like it helps making it bounce at all, it just add some impulse to push the object it hits. my problem still is: if it hits something with "simulate physics" on it will push it and then keep moving, without any change to it's speed or direction, else if it's a pawn it's destroyed -and apply some damage to the pawn-, else it just ignore the mesh, even if the mesh is set to block all. "if it hits something with "simulate physics" on it will push it and then keep moving"
Simulation on, on the mesh or projectile? What will keep moving your mesh or the projectile? 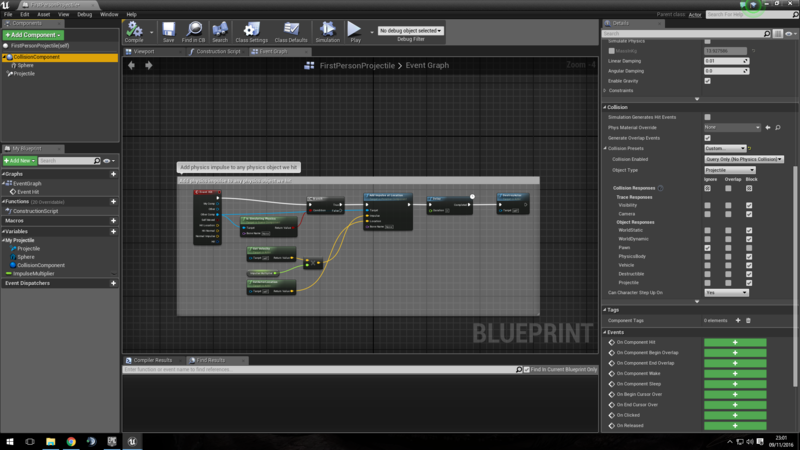 You'd have to post some screens of your blueprint's code to troubleshoot further. about the code: there's no code at all in this "LaserProjectile", and in it's parent (Projectile) there's just a big "Event ActorBeginOverlap", but it's set to overlap only pawns, so there's no code being called. Without anything hooked up in the parent class it should behave like a standard projectile component right? Like the standard one I can test with? Sounds like the mass of your projectile and its velocity is way too high. It should still bounce off static meshes that aren't simulating physics though. exactly, it should act like an standard actor with a colision, static mesh and projectile component, the mass is ~~100, the velocity is 1200, but i've tried slowing the projectile to 100 and it still didn't bounce, i'm not sure if the mass of the mesh is affecting something with simulate physics off. How do I make one object bounce off another object? How can I change the velocity of projectile with simulating physics?